The ascent of what is today called the middle class - others called it proudly the bourgeoisie in the early or mid-19th century - was accompanied by lively debates, the flourishing of dissidence and sharp-witted criticism. By the 1850s, this tendency that was in full bloom already during the 18th century, was already waning. More and more, during the decades that followed, the critical stance found a haven at the margins of society whereas a saturated bourgeoisie that had gained decisive socio-economic influence and that had conquered political power, became defensive, if not apologetic. It was a class whose spokesperson tended to defend things as they are. The arts, artists and writers that were worth the attention they coveted and sometimes gained, remained unconvinced when observing this complacency. The critical "gestus" of noteworthy art and literature emerged during the revolutions of 1830 and 1848 in France. Except for short interruptions, as in the heydays of nationalism shortly before and during World War I, it has been characteristic of the "bohemia" ever since. That is to say, until the commodification processes became extreme, and until the art market and public relations strategies with respect to the book market, accompnied by major processes of capital concentration in these fields, became hypertrophic in the phase of globalized (thus Americanized) corporate power, that has become almost omnipresent under financial capitalism in the late 20th and early 21st century. Today, our critical voices are not only marginalized. The mainstream outlets filter and separate the admissible from the unwanted. Strategies become necessary to enter the circuit as a critical thinker that tend to deform because they demand caution and compromise. Perhaps this is a reason why the internet has become a refuge for those whose voices are otherwise almost silenced under the pretext of being "unattractive" for the general public: too far from a general denominator produced by the dominant outlets. The lively and manifold quality of alternative debates has occasioned, however, a backlash. When citizens, engaged in acts of civil disobedience (often motivated by ecological concern, opposition to militarism, or concern caused by a permanent mutilation and deformation of 'liberal bourgeois democracy' as we knew it, or propelled even by the quest for participative democracy), post certain videos on Youtube, they often find their video statements deleted. Obviously, governments have created a sort of internet police. Departments of the security apparatus (which may be called more appropriately an insecurity apparatus) have stepped up wholesale preventive surveillance of ordinary citizens. Based on lists of keywords, they also scan our statements on Facebook, Twitter, etc., establishing a largely unobtrusive thought control in social media. As mentioned already, the post was deleted. When this was discovered, it was placed again, in April 2015, on the same Facebook timeline. On the very next day, it was discovered that the computer used for this purpose had been severely attacked. Such attacks continued throughout April and until May 22, when we were finally unable to access the internet for a long period, finding a solution only at the end of June. The May issue of Art in Society, effectively obstructed, thus was put onlkine only in early July, 2015. The same had happened during the days in late August 2014, when the anti-war issue of Art in Society was uploaded. The work was interrupted by a series of attacks. It could be resumed after solving computer problems in the course of September. It is noteworthy that there occurred no attacks since the nuisance experienced in late August and early September 2014, until that day after the second critical post on Facebook. The temporary connection with critical "content" placed on the internet is very obvious. And so the mainstream media and mainstream politicians tell us there exists freedom of thought, of debate, and absolutely no censurship in our free societies. Yes, it is true - you can think freely if you remain a critical and awake person, but at your own risk. The likelihood that you end up being "listed" IS NOT SMALL if those who read letters to the editor published in the Guardian or Suddeutsche Zeitung notice your critical comments. Or if you voice critical remarks online. There is no censorship, except that things get deleted and that there are "gatekeepers" that sift our critical comments you try to post on a public radio site. Yes, and of course there is the "economic" censorship that marginalizes authors, filmmakers, composers, musicians - often, the ideological motivation for such exclusion from major circuits seems to outweigh the economic interest to make money. Georg Kreisler noted that for years he was boycotted by public television and radio in Austria. His case is no isolated case. Have you noted that even WDR seems to have blacklisted Bob Dylan almost completely? That we hardly see films by Daniele Huillet and Jean-Marie Straub, by Godard, Fassbinder, Chris Marker, Robert Kramer these days? Merely because "the public does not care for them"? Who says so? And what kind of apparatus creates public preferences - in whose interest, or for what reason? It is clear that Daumier faced censorship and acts of repression in mid-19th century France. The Charlie Hebdo editors were naïve when they assumed that they were upholding a "freedom of expression that exists in France." They were upholding their right to mock a minority, seemingly justified by the more idiotic and intolerant members of that minority in France. But they were not upholding a "freedom of expression that exists in France." It doesn't exist, fully, in France and probablyin no country on earth. You can say, unharrassed and unhindered, what you want if you remain within the spectrum of a so-called mainstream consensus. In obvious dictatorships you can say what you want if you more or less say what government-controlled media say. If you want to say something very different that challenges them, you better keep it to yourself. The sad thing about our "liberal Western democracies" is that we are approaching this state of things, slowly perhaps, but surely. People land on lists. Tony Benn landed on a list of suspects as a student. The Guardian revealed, in the weeks when NSA surveillance was starting to be discussed in this paper, that Tony Benn is still on that Big Brother list that lists suspect people. Ah, the Guardian ! ITS JOURNALISTS CAN TELL YOU WHAT IT MEANS TO BE HARRASSED, TO BE FRISKED AND INTERROGATED ON AIRPORTS. Some people have their manscripts stolen, flats searched; some find it difficult to find jobs later. Did the Guardian back down when pressured? Did he keep his courageous journalists on the paylist? Freedom, we all long for you. But few defend it. Least of all those elected by us to defend it, or their security apparatus employees. Art in Society # 15 was supposed to be online in May 2015. On March 8, 2015, I had reposted a video on Facebook that I found on the page of a Facebook friend. And I had added a few critical questions, plus some info. This post was deleted, as I found out later. So I posted that again on April 10, 2015, adding more disconcerting news items. The day after that repost (with added info), the computer used to post this was attacked. I managed to go back to an earlier version of the system, though, and informed a friend (in a mail sent at the time) about these problems which contributed to a delay with regard to my work. On Sunday afternoon, May 17, 2015, the computer was again attacked. This happened while I was about to access Hotmail but this was also in the final phase of uploading files for an online poetry journal, Street Voice, that had just been described on my Facebook timeline by an Indian left-leaning poet (addressing other poets in India) as "a leftist poetry journal." I try to describe here, as a layman, what I observed: The www.google.com page that I had just opened with the Firefox browser began to “dance” rather than remain steady. Typing became slow and erratic when attempting to type the name of my email provider, Hotmail. The H wouldn't appear at first, but then there were many hhhh, then I tried again and got an h and an empty space before the o would follow. Then part of the page (THE SCREEN) began to turn black. I managed (again) to “solve” the problem – at least on the surface level. I ran my antivirus program which found no virus. But it's a tool which tells me regularly that parts of my software are “password protected” and cannot be screened. On Monday, May 18, 2015, I let the antivirus software screen D: which contains Windows software. On that Monday morning (May 18, 2015), the antivirus software identified what it termed a “threat,” describing its degree of severity as “high”. The antivirus program said it had identified “MBR:Cidox-C[RTK]”, giving its filename (or the name of the infected file?) as “pagefile:sys”. The program informed me that it would attempt to repair or isolate the file. I got no further information. On May 22, 2015, the computer was again attacked. It was on that same day, I think, that the modem ceased to function. It took time to solve the problem, this time. I was finally able to go online again on June 25, 2015. When I was able to update Windows on June 25, 2015 (the first update I was able to start since May 19, 2015), I was informed that 10 important updates would be installed, including the June version of the Windows tool for the removal of malicious software. After completing the download of the Windows update files, I was informed on June 25, 2015 that only 9 filed were installed. One file was not installed. Windows gave me the “number” (code) of the problem or "mistake" that had occurred. Was the file that the computer was not able to install the “malicious software removal tool”? Is this in order not to remove a government Trojan, in order to keep the backdoor open? In July 2015, the mouse ceased to be able to point at things again. The problem disappeared when I replaced the mouse by a new one, but soon the new one was afflicted by the same problem, too. I can only formulate a hypothesis that the frequency of problems that occurred in April/May 2015 and again in early July 2015 (when the upload of Art in Society # 15 and Street Voice # 6 was completed) is no accidental thing but connected with my remarks posted on Facebook and with the content of Street Voice issue # 6 and perhaps also the new Art in Society issue, even though I would say that the progressive bias of these new issues is a very mild one that normally should be tolerated. But then, there was this assessement uttered on the Facebook timeline that Street Voice is "left-wing" and surveillance personnel can be far more conservative than editors of printed mainstream publications. As I told friends and colleagues last year, the computer was severely attacked in late August and early September 2014 while being in the last phase of uploading ART IN SOCIETY # 14 (the anti-war issue that remembered August 1914) and also when I was uploading Street Voice # 5. Typical problems faced in late August 2014 and still in Sept. 2014 included a FREEZING COMPUTER SCREEN (experienced also in March 2015), impossibility to exit the internet, impossibilty to point the mouse at anything and use it to click on something, a black screen, etc. Such recurring obstruction made it impossible to complete work on ART IN SOCIETY # 14 and on STREET VOICE # 5 in time. In 2003 or 2004, I was using a COMPAQ computer that I had bought for my publication activities in the late hours of the day in my office which was in the small building mainly occupied by the Airport Design Center of Aachen Technical University (RWTH Aachen Institute of Technology). My computer was linked to the server of the airport design center. When my computer was attacked, they had big problems and deconnected me from their server. I got a separate internet access thereafter. In 2005, this computer was again attacked and made useless. An old friend gave me a new computer, so I could continue my work – which may have been perceived as unwelcome because, like others, I was ,critiquing the illegal war on Iraq (and the war in Lebanon, for instance) in Urban Democracy www.urban-democracy.org. If I'm not mistaken, the next computer was destroyed by a virus attack in mid- or late 2006. A married couple (two old friends) bought a second-hand Vaio notebook for me in late 2006. I think that it arrived by mail in early January 2007. In late January 2007, the hard disk (Festplatte, as they say in Germany) of my Vaio notebook was destroyed. It could not be reconstituted or repaired, the guy at the computer repair shop said. My old friends who had given me the Vaio bought a new hard disk for me. I don't know any more how many times I have erased all content on this repaired Vaio notebook (with its new hard disk) between 2007 and 2014, installing all software anew from scratch. It must have been a dozen times at least. In spring, 2008 I ran into problems. Between March 14 and June 12, 2008, my computer was incapacitated. "DeepScan". Another virus is identified as "Win32.Virtob.8.Gen". No more than half a dozen attempts to access the internet occurred in March, 2008. If you are a specialist or otherwise gained experience with hacking, please let the editor of ART IN SOCIETY know whether these attacks (and their pattern) are significant and how you would interpret them. - THANK YOU! Backdoor.Robot.F that infected the computer on March 13, 2008 definitely sounds like one of these Trojan horses used by German secret services. It could also be “American” perhaps. The effect it produced immediately on that day was a freezing computer screen. Since June 8, 2008, going online by connecting with my internet provider became problematic. (This was echoed in May 2015. also the problem with the browser, except that in 2015 it was the Mozilla Firefox browser.) On June 8, I could go online but could not open the start page of the Internet Explorer, thus could not carry out an online search OR access my email account. On June 9, I could again connect with the provider (thus the internet) BUT trying to open the Internet Explorer again got the message that “the website cannot be found.” When trying to use Mozilla Firefox, this website also could “not be found.” The problem persisted for quite a while. “Achtung: Norton Internet Security ist auf einen Fehler gestoßen. Wir waren nicht in der Lage, eine automatisierte Reparatur für dieses Problem zu finden. Wenden Sie sich an unsere Support Website, um weitere Unterstützung zu erhalten. On Jan. 17, 2012, I wrote an email to Doris Schoettler-Boll saying that I could not carry out the Norton Internet Security update since mid-December, 2011; update files could be downloaded but either they could not be installed at all or only partially (some, of a bunch offered on a certain day, yes; others, no). allerdings nicht NIS 2012, sondern die Version davor, also Norton Internet Security 2011. Heute geschah es, dass das letzte der heruntergeladenen Updates nicht ausgeführt werden konnte. I must add here that my irritation regarding the lack of reliability of the most expensive antivirus software on the market has let me switch over the years from Norton to Bitdefender to Kaspersky back to Norton, again Kaspersky, then Avira, than Avast, then again Avira... Each, a one year subscription – and each one of limited usefulness even though I keep my software and APPS up-to-date and update antivirus programs regularly. In January 2012, typing became problematic. Accessing the Windows “help page” that gives information on keyboard problems, a text was displayed on the screen that replaced certain German diphthongs (Umlaute: ä, ü, ö) by Chinese characters. I'm not happy about AdobeARM.exe being allowed rule on my computer. What does this imply? I have read in mainstream newspapers that big software firms and firms that offer search services, browsers etc. cooperate with – for instance – the N S A. Since early October 2012 I stayed mostly offline for several months due to repeated problems, while using my second-hand Vaio notebook. As 2012 was drawing to a close, I bought another second-hand computer and in January 2013 the necessary software to run it. There were immediately problems with this “new” computer and I went back to my old Vaio notebook. Working with the VAIO remained problematic. In spring, 2013, I sent the following message to friends: “For several month, I could not log-out of my Hotmail e-mail account, [in fact] since early October. Avira Internet Security frequently didn’t work. Other suspicious errors occurred. On Feb. 1, 2013 the Avira Internet Security updater let me know me that the update was aborted. 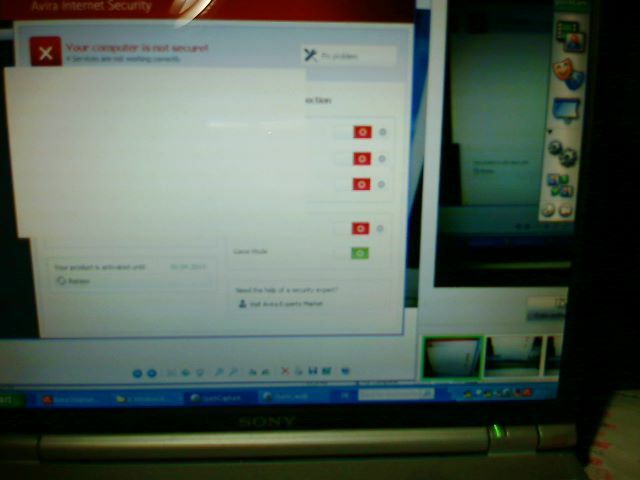 With my web camera I took a picture of the screen of my Vaio notebook at the time that documents how most protection options of Avira Internet Security were not working. Turned off by “a hidden hand”, they could not be turned on again manually without being turned off again immediately. I think that only an option not used by me (that enables adults to keep their children from accessing this or that) was not turned off. The Avira Internet Security firewall (and when I switched to it, also the Windows firewall) was turned off, and then again and again turned off when I turned it on manually. I could not update my antivirus software anymore for some time. 'On Feb 19, 2013 in the evening. I tried to access my Hotmail account and got the message: “The service is unavailable.” The log-in failed. This problem persisted. 5 Sony UpnP framework notes an error on this computer every day when I start the computer. Then, there was a severe computer attack on Sept. 2, 2013. This was the last one before problems set in again in late August, 2014 while uploading the anti-war issue of Art in Society. As I noted, there were no problems after I reset the system subsequent to the attacks that occurred in August/September 2014, things were alright for about six months, until problems resurfaced on the day after my second critical timeline post on Facebook in April. Visit Street Voice # 6 .